I came back exhausted and depressed from Documenta, the sprawling exhibition of international modern art that takes place every five years in Kassel, Germany. The artistic directors this year are the freelance curator Roger Buergel and his art historian wife Ruth Noack, and between them they have managed to stage the single worst art exhibition I have ever seen anywhere, ever. Though Documenta 12 has more than 500 works, so much of what is on view is second-rate, chosen for who knows what reason and displayed so eccentrically that, just as in the Royal Academy's summer exhibition, it is easy to overlook the few really good things in it. The only thing a critic can do is to try to distinguish between what was done deliberately, and what is simply bad taste. To create their exhibition, Buergel and Noack began by choosing themes so vague as to be meaningless, ranging from "Is the modern our antiquity?" to "What is our mere life?" This enabled them to include any work of art by any artist, living or dead, from any era in history right back to the 16th century. Their next step was to ensure that the show had no form or structure whatsoever, claiming in the introduction to the catalogue - wrongly and with absolutely no justification - that large shows of this kind are inherently formless. Minimalist and figurative work is exhibited side-by-side with conceptual art, installation, film and video with no thematic relationship between the mediums that I could discern. The fact that there are many more artists from Eastern Europe, the Middle East and Far East than from Western Europe or America might have been interesting, if only the work in the show had been better than it is. But entirely absent from almost every work on view is a sense of emotional depth, ambiguity, or psychological or moral complexity. To take two examples almost at random, Ahalam Shibli shows colour photos of the homes of dispossessed Palestinians in the Naqueb; George Osodi's photos document the struggles of the poor people who live in oil-rich coastal Nigeria. That's fine, but because the only possible response to these images is to feel pity or anger, as the artist intended, these are works of reportage or photojournalism, not high art. They have only one layer of meaning. Halil Altindere shows a film about a Kurdish tribe called the Dengbejs, who, unusually, chronicle their history not by reciting epic stories of rebellion, massacre and family tragedy, but by singing them. The film is well made and the subject may be of interest to some people, but it is informative, not poetic or allusive, and so belongs not in an art exhibition but on the Discovery Channel. The trouble with Johanna Billing's film about a group of musicians learning to sail on the Firth of Forth is not just that it is exceptionally dull - but that it doesn't transcend its status as a documentary to become memorable as a work of art. And that brings me to the question of taste. 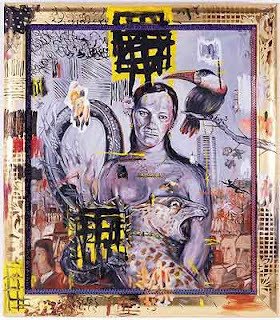 I couldn't believe my eyes when I saw how many works there are on show by the Chilean-born Australian painter Juan Davila, an artist whose high-camp imagery is best characterised as pornographic folk art. His heavy-handed satire is what you'd expect in the work of a political cartoonist, only Davila is a crude draughtsman, uses a paintbrush as though it were a sledgehammer, and isn't remotely funny. Until this show, I didn't think it possible that his work could receive attention outside Australia. And then there is the inimitable Mary Kelly, whose Primpara, Bathing series consists of a series of black-and-white photographs taken between 1974 and 1996 showing the artist cutting her toenails. Now, for any of you who are too young to remember, this feminist conceptual artist achieved some notoriety 20 or so years ago by exhibiting her baby's soiled nappies at the ICA. Her art was so jaw-dropping in its banality that I've never actually met anyone who had anything positive to say about it. Until now. Of all the female artists in Britain - from Gillian Wearing and Rachel Whiteread and the Wilson Twins - the one whose almost forgotten work the Documenta curators chose to resurrect was Kelly. And she's as terrible today as she was back then, showing an installation of texts and photographs surrounding an illuminated glass house in which she expresses her feelings about a women's liberation demonstration that took place in 1970. The quality this elaborate installation shares with almost every other work of art in the exhibition is the complete absence of nuance or subtlety. Of course, there are good things in Documenta. But I began to feel that they got in under the radar, by accident, not because the artist had talent, wit or originality but because he or she came from the right part of the world or had the correct political opinions. Nigerian artist Romauld Hazoumé showed a wall with African masks made of plastic petrol cans, oil cans and tea kettles, decorated with bristling hairdos made of toilet brushes and straw. Here was real wit, and a connection made between modern industrialised Nigeria and its ancient tribal culture. 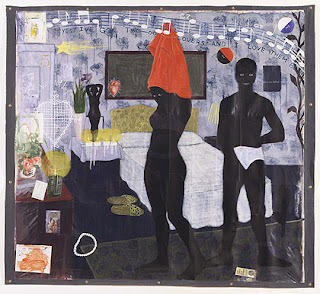 One of the stars of the show was the American Kerry James Marshall, who shows fresh, funny and sophisticated paintings and works in pen-and-ink based on the urban African-American culture he comes from. Also nice to find were the British artist John McCraken's minimalist sculptures. And I'd like to see more of the watercolours and sculptures of Bangalore-based Sheela Gowda. I know where Gowda and all the other artists in the show come from because the information is buried deep inside the catalogue, not because the viewer can find it on the labels. The organisers believe that the artist's nationality should not come between the art work and the viewer's response to it. But nationality is often vital to the context in which we view a work of art. Refusing to give us the artists' nationalities is just arrogant, particularly as it denies the viewer information that was available to the selectors. This is a show organised by two pseuds and intended for graduate students and people who don't really like visual art at all.